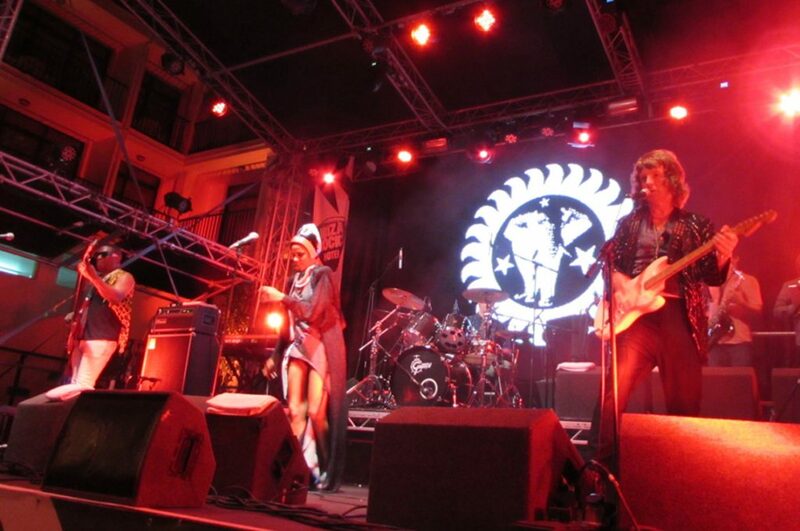 The Brand New Heavies were quite a feather in the cap for the first October festival and there was quite a buzz about their appearance, though I couldn’t profess to know them well myself. Actually nor could many other people I talked to. Everybody knew them as a major name, but few could name any of their songs. My enthusiasm for the night was boosted with the excited call of my oldest Ibiza friend Carlos, a man with impeccable taste in music though less so in swimwear (he carries a photo of himself in a Ku ‘Mr Tanga’ competition). If they were good enough for Carlos they would do me. Prior to the interview I diligently turned the office playlist to the band and spent the next couple of hours saying things along the lines of “so this is one of theirs”. One of those bands. If you don’t think you know them, you would if you heard their greatest hits. A 10 minute interview was allotted, normal in this type of post sound-check, pre-dressing room, press call. I don’t blame them, it must be pretty dull going through the same questions over and over. I tend to select the last slot—at least you can offer them the good news it’s nearly over. So expecting a relatively routine interview I was surprised on arrival that guitarist Simon was exuberantly telling the penultimate interviewer, a bemused, confused and slightly scared looking young Spanish girl that he wanted Bacon and Eggs right now so he could throw up all over the place. Simon repeated his desire several times asking her advice on the availability of an English fry up and was clearly keen to ensure she knew what bodily functions he intended to display as soon as he had consumed it. Either he was very bored by proceedings, a bit of a tease, or proper old school rock n roll. I hoped for the latter. It turned out that Bass Player Andrew had lost his phone and was in a bit of a panic about it, which seemed far less rock n roll, and so with only 3 heavies left I was co-opted in as the fourth for the required photo shoot. This no doubt confused the preceding interviewer even more when she got back to her desk and compared her photo to others of the band and found a white bald man sitting where a black bald man should be. My money was now firmly on Simon being a bit of a prankster and so it turned out to be. A very happy chap always looking for the next way to take life a little less seriously. The heavies new vocalist looked positively ill, I wondered for a moment if this was another of his pranks, substituting the Amazonesque Diva I’d been watching in videos with somebody he’d found doing voluntary work in a West African health centre. Lastly we had drummer Jan, who formed the band with Simon and Andrew 28 years ago—all original members still going strong—and you immediately had the impression they had him to thank for that. The one who held it all together, which is quite apt because that’s exactly what drummers do. NG: I was listening to your Hip Hop vocalists album this afternoon. Brilliant. Any plans for similar projects in the future? The heavies made an album where each track featured a different Hip Hop/Rap vocalist. Jan: Maybe. The only thing is it’s so hard to put together. A logistical nightmare. So many artists, so many management companies and release schedules. Right now it’s more important to concentrate on getting our vocal work going again with Dawn. Also Hip Hop has changed so much. More commercial and perhaps less interesting. Simon: It’s a musical love kind of project. You do it because you love it. Obviously you can’t tour with it. We are talking to a guy in Croatia who has some really interesting connections for something similar. We’d like to get Dawn involved, perhaps adding some chorus., it could be really good. Jan: That album was of a moment too. We had Far Side, Black Sheep, people like that who hadn’t really done much at that time. I don’t know if you should try and go back. Simon: Who would you want to see on it? NG: I was thinking a Grime project might work well. You might chill them out a bit. That got the always desirable early laugh. Interviews always relax a bit after a laugh. NG: Dawn, you’ve joined a band with 28 years history behind them. Daunting? Dawn: Yeah I know, I guess I want to, er, try and inject some energy. Keep them young, ha ha. God I want to inject some energy in myself right now, way I feel. NG: How did you get together? The next couple of minutes are obscured by Simon running with the hilarity of the Trombone as an instrument. I try to professionally listen to Jan and Dawn but a big part of me wants to go play with Simon. Buy him some Bacon and Eggs and see where the night leads. Jan: The new record was taking a long time to complete., N’Dea was moving away. Her heart didn’t seem in it. NG: Your new album Sweet Freaks is due any time now right? Jan: 24th October, so yeah a few days away. NG: Will we hear much of that tonight? Simon: We’re playing something from every album we’ve produced. We’re on for an hour and a half. NG: Good my friend Carlos will be pleased he’s going to get some of your classics, what direction is Sweet Freaks, would you still call it Acid Jazz? Jan: Not really, but what is Acid Jazz? NG: Just sounds such a cool genre. I like saying it, it sounds nice. Simon starts repeating Acid Jazz in a variety of inflections. NG: Have any of you got much of an Ibiza connection? How long are you here for? Simon had earlier teased the Spanish escritores that they were staying in Ibiza for 4 years, a duration I imagine he’d increased as every of the afternoons interviews had asked the same. His pre-occupation with the joys of saying Acid Jazz meant I escaped the same. Dawn: No we’re just in and out. We fly off to Korea and Japan for gigs tomorrow. Jan: We played with Carl Cos at Mambo a couple of years back—a one off for a documentary he was producing. NG: Thanks very much, looking forward to the show. And great show it was, but for that I’ll hand you over to Claire. 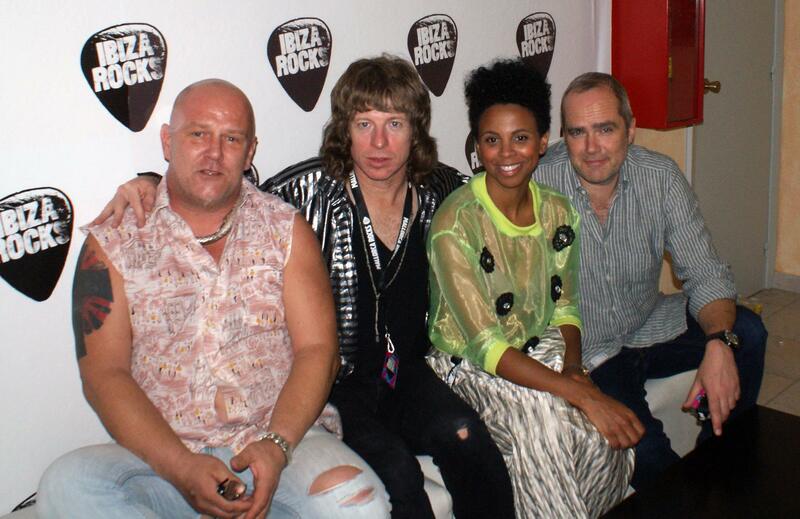 One of the highlights for me of the inaugural October Festival was the live performance of the Brand New Heavies at Ibiza Rocks. The acid jazz and funk pioneers have had an astonishing 16 top 40 singles since they were formed in London back in 1985 and lots of island residents were looking forward to seeing them play, myself included. Also on the line-up were Boss And Over from Madrid, who did a great job of entertaining and warming up the crowd with their Spanish brand of funk and soul mixed with bossanova as they arrived at the venue before the main event. 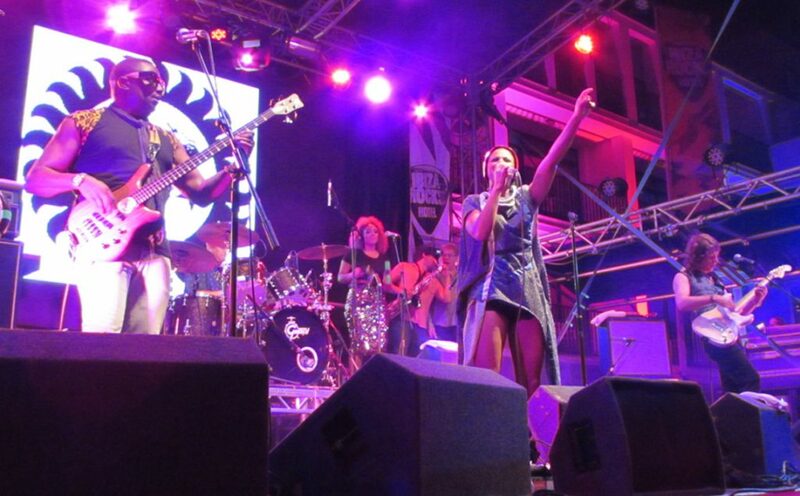 The Brand New Heavies appeared onstage with new vocalist Dawn Joseph and quickly got down to business for the appreciative crowd who danced throughout their set, which lasted well over an hour. Playing many of their hit singles, including ‘Dream On Dreamer’, my personal favourite ‘Spend Some Time’, ‘Never Stop’ and ‘Midnight At The Oasis’, mixed in with a few new songs from their forthcoming album which is being released later this month. The atmosphere in the venue was great, made up predominantly of island residents of a certain age who remembered the band when they were churning out their hits in the 90’s, and who were happy to turn back the years and dance the night away under the stars. The band put on a great performance and it was fantastic to have just one more night at Ibiza Rocks before it is mothballed for the winter until next year.